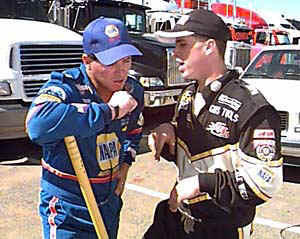 Photo courtesy Martinesville Speedway TWO OF A KIND: Ron Hornaday (left) and his son Ronnie, who will trying to make his Craftsman Truck debut this weekend in the NAPA 250 at Martinesville Speedway. The pair joined several other drivers in a test session Wednesday when Jack Sprague set the pace with a lap of 20.348 seconds, 93.061 mph. Ron Hornaday tested along with his son, Ronnie, who will attempt to run his first Craftsman Truck Series race. "This is only the second time he has driven a truck. He only has 50 laps in a Craftsman Truck Series truck before today," said the driver of the NAPA Brakes Chevrolet. "I'm pretty excited about it. For him to come to Martinsville is a good experience." Ronnie Hornaday said learning from a father who has been so successful in the Craftsman Truck Series and now trying to race with him is both good and tough. "It helps you a lot, but at the same time it puts pressure on you because you have big shoes to fill," he said. Heading into the NAPA 250 NASCAR Craftsman Truck Series event at Martinsville Speedway (VA) this weekend, Ron Hornaday Jr. is feeling a little pressure. Currently leading the NCTS season standings scoring two wins in the first four events, Hornaday isn't worried about winning at Martinsville even though it's one of the few tracks were he has yet to visit Victory Lane. This time around, he's concerned about something much more personal. "There will be a little extra pressure because my son is going to debut in my wife's Truck at Martinsville," said Hornaday of his son, Ron III. "On top of that, Dale (Truck owner Dale Earnhardt) will be there, myself and then my son. I've got to look out for Dale, and I have to watch out for my son. So it's going to be tough." Hornaday's #16 Chevy returns to the 0.526-mile Martinsville oval where he started sixth and finished third a year ago. He was fourth in the 1996 Martinsville Truck race. Meanwhile, Hornaday III will debut in the #97 Truck owned by his mom, Lindy. Hornaday III has been running a limited Winston Racing Series schedule at Caraway Speedway (NC). Just in case the elder Hornaday didn't have enough on his mind, NAPA Auto Parts, the event sponsor and the backer of Hornaday's Chevy Truck, will have more than 700 guests on hand for the race. That means extra hospitality and sponsor functions for the 40-year-old driver. "Last year was the first time that we led a lap at Martinsville, so this year we're going there looking for a win," said Hornaday Jr., who has already won at Phoenix (AZ) and Monroe (WA) this season. "It's one of the tracks that we haven't won at. Martinsville is a track that everyone likes to go to. It's a short track. It's a fast racetrack, and it's hard on brakes. You just have take care of the Truck and be there the whole 250 laps."